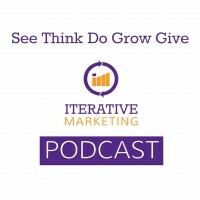 See, Think, Do, Grow, Give is a framework of consideration states that all prospects and customers have been in at one point or another. This framework is the backbone of how we structure marketing programs because it is customer-centric and aligns with the Iterative Marketing methodology. See, Think, Do, Care is a framework developed by Avinash Kaushik. We’ve modified it to replace Care with Give. See: largest qualified audience. Prospects in this state are not thinking about purchasing your product or service. Think: audience member is qualified and thinking about purchasing your product or service. They have a need. Do: audience member is qualified and has made a decision to purchase. Grow: audience member has purchased your product and would choose to purchase it again. Give: audience member purchased your product, they love your product and tell others about it. Marketers cannot move people from state to state. Only audience members can move themselves. Marketers can, however, create the best experience for prospects to reduce friction as they move closer to a purchase. Prospects and customers move freely in and out of sales. Their journey is non-linear.